The N4L model provides a means of visualizing and linking to other data in a biological context. George Garrity presents the N4L system in “Automating the Quest for Novel Prokaryotic Diversity (revisited)”. Previously, we demonstrated the value of using techniques drawn from the field of Exploratory Data Analysis (EDA) for the analysis and visualization of large sets of sequence data (notably SSU rRNA gene sequences) that are used to construct a comprehensive taxonomy of prokaryotes. 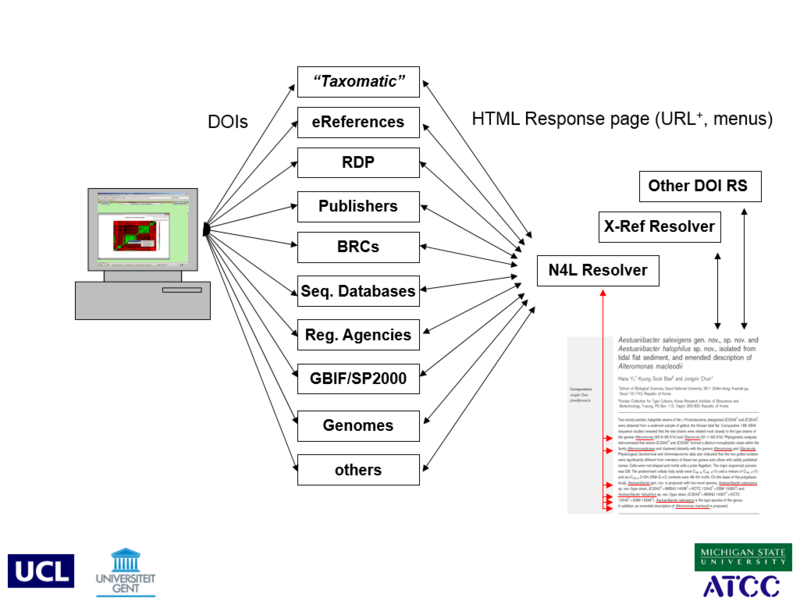 While the approach is computationally efficient and quite useful in uncovering a variety of taxonomic and annotation errors, the methods suffered from some practical limitations; notably bottlenecks in the preprocessing of data for our analyses. Work is currently underway to address these limitations that will greatly expedite the preprocessing steps through a pipeline approach. In addition, new methods are under active development that will automatically flag misidentified and potentially novel sequences within a given dataset and automatically place such sequences into close proximity to their nearest neighbors, based on 16S rDNA sequence homology. These methods will also permit linking of EDA plots, derived from such analyses to external data and information resources. [permalink] Posted July 1, 2005.